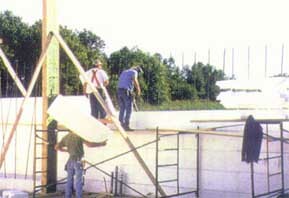 Depending on the size of the building project, labor is kept to a minimum. The only skilled labor required is a 'rough' carpenter and support laborers (unskilled). All the tools needed to set up the Consulwal™ concrete wall forming system are a part of a rough carpenter's tool kit. (i.e., saw, plumb line, level, snips). A Consulwal™ concrete wall should typically be completed in at most ¼ the time of concrete block construction and at most ½ the time of traditional forming. Piping and wiring are easily cut into the form, therefore, standard installation methods are recommended.